Blindness is more feared by the public than any other ailment. Nowadays Smartphones has become one of the basic amenities of Humans. Though the various touch interactions has become latest, affordable, sophisticated but easier, it became impossible for the visually impaired. As they need physical interaction with the device. 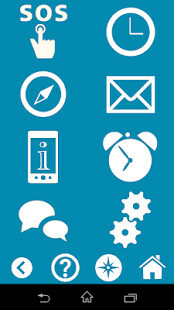 Touch screens are often used as a common interface element of mobile devices such as Tablet PCs, PDAs, and smartphones. Touch screen interfaces offer users several advantages over interfaces with physical buttons. One advantage is flexibility of presentation and control. 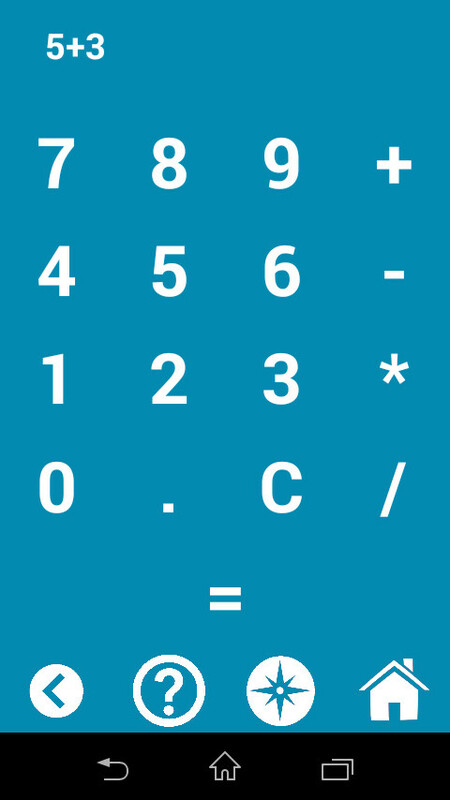 A touch screen device can display different interfaces on the same surface, such as a scrollable list, a QWERTY keyboard, or a telephone keypad. Unfortunately, touch screens can present significant accessibility barriers to blind users. Most touch screens provide no audio or tactile feedback, making it difficult or impossible to locate items on the screen. Because of these difficulties, blind users may need to be shown the locations of on-screen objects by a sighted person, may need to use an alternative accessible interface (if available), or may be completely unable to use a device. Although some assistive technologies can improve touch screen accessibility, these typically require additional hardware buttons or provide only limited use of the touch screen. Thus, most current touch screen interfaces remain inaccessible to blind users. In response to these limitations, we developed 24Droid, a set of accessible multi-touch interaction techniques for touch screen interfaces. 24Droid provides a completely non-visual interface that re- purposes a touch screen as a “talking” touch-sensitive surface. 24Droid is a Launcher, which helps to make of use of the touch screen smartphone's features. The size of the app is just 880 kilobytes and supports all the android devices (Even with lower specs). This can help not only the visually impaired but also the old aged person who finds difficulty in using the smartphones but requires some advanced features such as SOS in case of emergency. 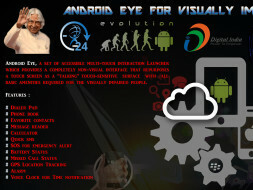 UI of 24Droid is designed in such a way that it looks very simple to use and easily accessible. Sample screenshots of the 24Droid UI is attached here. Won 1st prize in the ‘Tech Expo - Project Display’ held at Indian Institute of Technology, Jodhpur. Won 1st prize in the ‘APJ Abdul Kalam Memorial Project Contest’ held at Sri Krishna College of Engineering and Technology, Coimbatore. Even-though the software application alone can't give much features, hardware should be configured to get most of the features. 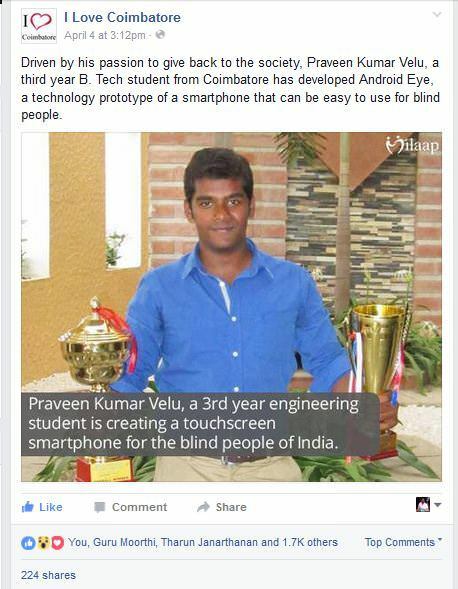 So, We are planning to build the prototype of 24Droid, the first ever Android smart phone build in India especially for the visually impaired. Approximate cost of this smart phone will be around Rs.8,000 - 10,000. This phone includes braille buttons along with the touch screen for quick and easier interaction. 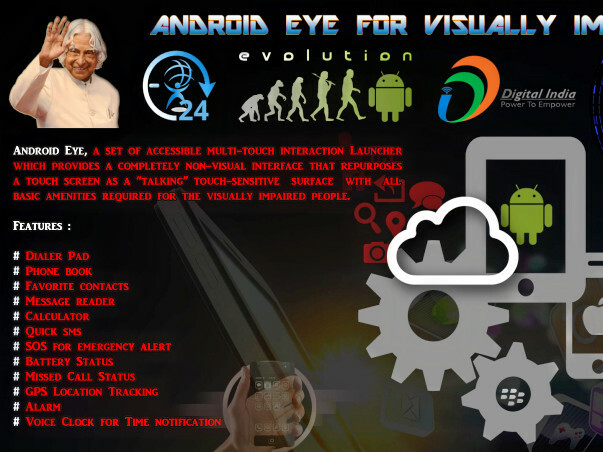 24Droid also holds room for most of the sensors and apps which helps the visually impaired people to walk, navigate, use the smartphone with all features like Internet browsing, chatting application and other features. The visually Impaired user can use braille pads, gestures and touch interactions with voice feedback and haptic feedback. The initial phase of the project has just begun and we are raising funds to further develop the prototype. We are in need of funds up to 3 lakhs for completing the prototype, which includes purchasing of hardware parts, braille keyboards and buttons, software development, running campaigns and other expenditures. This is completely a step towards make in India. We request you to support this campaign and your contribution may help us to develop this prototype which in result help millions of visually impaired people to afford a cheapest smartphone for them. Let we fill colors in the life of visually impaired.